Markdown today has arguably become the standard in which plain text writing is done for the web. It offers a powerful, easy-to-read & easy-to-write syntax and we’ve already seen a lot of apps with Markdown support. We’ve written about Ulysses III, iA Writer, Byword, Editorial, Jotterpad X and others already, but it’s always great to come across new Markdown apps and and try them out. 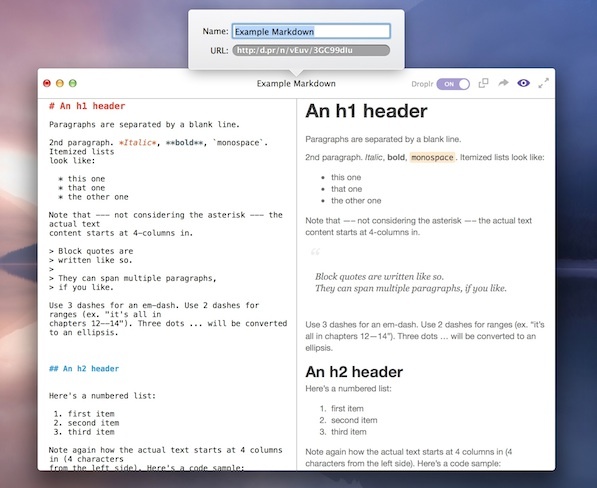 MarkDrop is a new Markdown editor for OS X (10.8 and above) developed by Droplr co-founder Levi Nunnick. As you might have guessed from the name already, it’s a seamless marriage of Markdown and Droplr. MarkDrop is gorgeous. It offers are modern User Interface that, much like Fonts for Mac, looks stunning on the screen. It’s mostly white, with crisp fonts and UI elements. The window consists of two panes — the monospaced, plain text Markdown editor with highlighting on the left and an instant preview on the right as you type, which you can also hide when needed. MarkDrop ships with two themes for the Editor (Light & Dark) and 6 themes for the preview pane. I wish there was a way to add your own themes though. MarkDrop is designed with seamless Droplr integration. 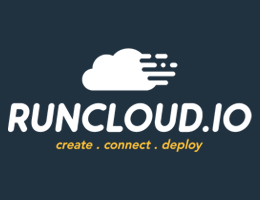 Anything you compose in MarkDrop can be stored “In the Cloud” on your Droplr account, accessible anywhere. There’s a simple, purple toggle switch at the top right that when enabled, allows you to save the current file to Droplr, preview it in the browser (using Droplr’s note feature) and share the file’s short link via the Share menu. I love that the save progress is indicated through a thin progress bar just above the editor window. If you’d rather not share or save your text on Droplr, MarkDrop also offers the option to save your files locally through a Finder window. This way, you can save the file in your Dropbox folder and still access it from anywhere. But MarkDrop shines best when used in conjunction with Droplr. The app also offers handy ways of handling the text you’ve typed, like exporting to PDF or HTML, instantly copying HTML to Clipboard and importing any Droplr note via URL. There are also nifty word & character counters at the bottom right to keep you updated. 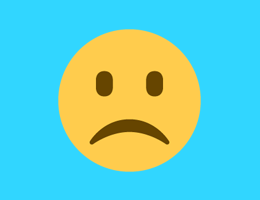 If you’re a Droplr user already, there’s no reason why you shouldn’t be using MarkDrop. It’s an extension of the note feature that Droplr offers. If you’re not using Droplr yet, MarkDrop is still a lovely Markdown Editor for OS X. It is available on the App Store for $3.99 today.